As a descendant of Simon’s brother, Thomas, I find this article to not hold the full truth on my ancestor. He simply believed in the way of the Indians, which was that no one should own nature. Was he a killer? Yes, but who wasn’t in those turbulent times. But to liken him to Osama Bin Laden is revolting! To liken him to Osama bin Laden is an insult to Osama bin Laden. I am doing some writing about Ohio frontier life and would like to communicate with you. I am especially interested in information about your ancestors as well as Peter Loramie whose trading post was south of Girty’s town aka St. Marys, OH. I somewhat agree with you,he just sounds like someone who was very common in those days. He seems most…interesting.If you have any info on him I would love it! Fascinating (though somewhat horrific) piece and Danielle’s perspective is interesting too. Your site would be enhanced by a photograph of the historical marker at Girty’s birthplace 6 miles north of Harrisburg, PA and the burial yard on his farm in Pittsburgh where lie the bones of his mother and brother. Ohio, Kentucky, Illinois, Michigan) was not a struggle over Grand Ideas about freedom and the Rights of Man- it was a rapacious struggle over the possession of land by the French, English, Americans, and, oh, by the way, Indians. Girty was one of the few prominent people who held sympathies for more than one of the belligerent groups and who exercised acts of conscience. Read Eckert’s Dark and Bloody River for more info. I am a direct descendant of simon girty. Osama bin laden was a blood thirsty terrorist who should have been killed a long time ago. my ancestor was a person who defended the lands and people that he cared about. The american colonists killed many thousand more people than simon girty and his native allies. But then again americans are always bending the truth to make their causes just. Alex….. This is VERY true! I descend from Thomas and feel this article doesn’t reflect even 10% of who Simon was. I was fortunate to grow up with Girtys Run in my back yard so I have always been interested in this particular lineage. Were you at the Girty reunions in the mid 90’s? Are you in Pittsburgh, Canada or elsewhere? Us Girtys need to stick together, especially when people use Osama Bin Laden as a comparison. Once again the Natives are lost to the white people’s agenda. If Simon Girty was ever captured during his sojourn with the natives he would have been brought before a military courts marshal and then after witnesses to his crimes against humanity who had survived would be more than enough evidence to ensure that Simon would have been hung for treason. In conclusion, he was a deserter, and in treason, he continued to lead native Indian tribal forces against the US, and non-combatants. The British Expeditionary Forces (BEF) during the Revolutionary war and the war of 1812 -1814 along with their Indian allies- continued making war along the U.S. frontier until well into 1815 instilling rebellion. Protection of the lucrative Fur trade was economic reason enough to try to retain these frontier areas. 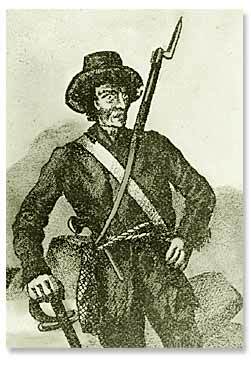 In the end the Indian nations once allies of the BEF against the Yankees..
Girty was a deserter and a turn coat who was never totally loyal to any nation. I think the author has been more than fair with Girty, including the comparison to Bin Laden. Don’t forget that Osama was once our ally and is still a hero to many people around the world. The Simon Girty that William Clark encountered most likely was not the famous Simon Girty, the white man. 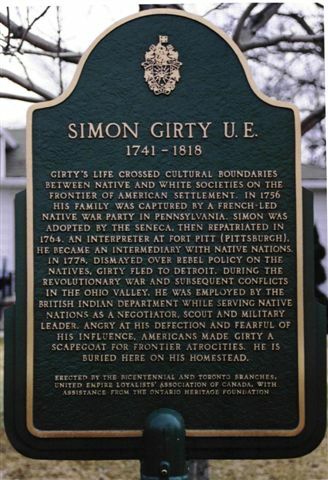 The Simon Girty of Illinois was a half white, half Delaware Indian who later migrated to Arkansas and then to Oklahoma settling with the Cherokees. His descendants still live in Oklahoma. The Simon Girty William Clark saw was born about 1775 and died in 1833 in Arkansas. This Simon Girty may have been a son of the famous Simon Girty from one of his many Indian wives. Delaware Simon’s children may be George Girty (killed by the Plains Indians in the 1830s), Isaac Girty, and Jack “Panther” Girty. The famous Simon Girty was quoted as having a wife in every tribe (Shane Manuscripts). Very interesting, I’d like to learn more about Simon Girty. Simon Girty was was a coward ,turn coat and deserter… some one only the English would defend as they have a history of doing that very well. The Frontiersmen: A Narrative by Allan W. Eckert. A very accurate portrayal of the people and places of that time. A truly invaluable read. Girty’s Run was named for Thomas Girty who was Simon’s brother. Thomas lived at the mouth of the creek where it spills into the Allegheny River. Appreciate the reading comprehension, John! I am a descendant of one of the 16 soldiers who fought off the siege of Bryan’s Station and then joined the Battle of the Blue Licks. Girty was involved in that. One of the many interesting aspects of that battle was that it was fought after Cornwallis had surrendered to Washington at Yorktown. Very interesting reading. That is the battle where Daniel Boone said “We are all slaughtered men”. His son Isaac died there and also his nephew, a son of Squire Boone. The problem with drawing distinctions between Girty and Osama bin Laden is that there are thousands, maybe millions of people who would say that Osama bin Laden was a hero who is just standing up for the Muslims against the evil (fill-in-the-blank). Girty assisted the English against the Shawnee in Lord Dunmore’s war, and though one of his good deeds was to save Simon Kenton from Indian tortures, Kenton’s hands were no more clean than William Crawford’s. The frontier was a raw, violent place with acts of cruelty and kindness on both sides. It’s better not to twist facts to fit today’s “political correctness.” Truth should always trump political correctness–of any stripe. It was a completely violent time in which to live. All committed various atrocities. The desire to view this one or that one as entirely, spotlessly virtuous seems a bit childish, doesn’t it? I’ve many ancestors from early PA history, as well as early VA history. I’ve read quite a bit on this subject. It seems somewhat appalling to ignore the obvious sin of slavery whilst admiring my many tidewater Va ancestors. We need to be much more realistic about these things. Time to grow up a little, and think a bit harder about what is really virtuous. Don’t forget that we (whites) have eliminated an entire culture (natives) for our own benefit! Shame on people,I’m researching him and I know he was also a hero to many.True, he was a bit of a bad person here and there but everyone has a good side! The same could be said for Osama Bin Laden. It really is a fair comparison. For shame to the people that think it’s a fair comparison,Osama was a monster,we should never forget that. Bin Laden was fighting for a cause in which he believed and while he may be a “monster” to you, he was a hero to many millions. Just like Simon Girty. So you may say, but he was the cause of many needless deaths…Girty was different,better.just because somebody says that cats don’t have teeth,that doesn’t mean they don’t. The article is very interesting, but the comparison to Osama bin laden is…kind of…horrific? my cousins wife is descended from Simon Girty’s 1/2 brother, John Turner. 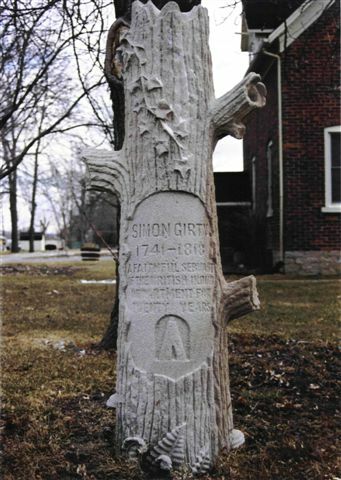 I found his memorial today and was surprised to learn his connection to Girty, who has, with Simon Kenton, been a hero of mine since boyhood. Simon was her 4th great grand Uncle. Fascinating stuff history, and so many perspectives. Osama bin Laden, my lands! There’s a bit of hyperbole. Oh well, every one has admirers and haters. saddly he is gone.thank you. Unlike that Osama bin Laden! Osama Bin laden was born into wealth which through his own industry he expanded to great wealth. He could have lived the life of ease, luxury and privilege as so many oil sheiks do but he chose instead to devote his life to driving out decadence and restoring his lands to the true Muslim faith. He fought and died for his beliefs. Just like your ancestor he was an enemy of the USA and that does not make him any less a hero to his own people.